IIM Ahmedabad’s selection criteria also opened a can of worms and had people talking about how cruel it was to be born as an Engineer. Let us face it, if you are born in India into some type of families, you have only two choices, be an Engineer or be a loser. Having said that, a great many students have taken this as an open season to crib when they have no reason to. Let us see why. To cut a long story short, an engineer cannot get called for an IIMA interview if he did not score an average of 80 in 10th and 12th and a minimum of 78% in Engineering. It does not matter if you have scored 99.99th percentile in CAT, you cannot get into IIMA if your BE percentage is 76%. 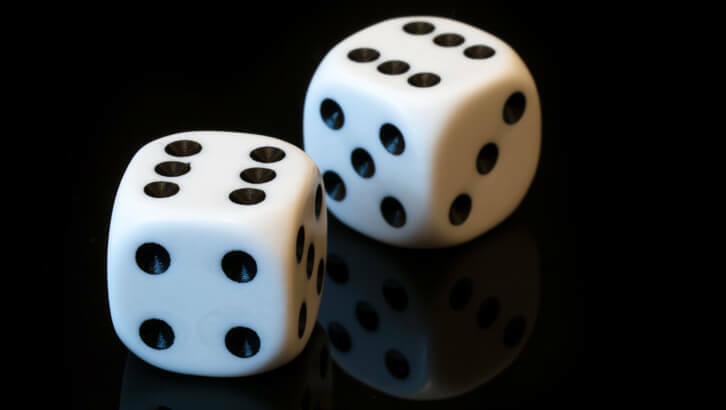 Now, let us look at this within the framework of conditional probability. P(A / B) is defined as the Probability of event A happening given that event B has already happened. Here the big crib is that Prob (IIM A interview / BE score of 77.5%) = 0. However, this is not necessarily the correct metric to look at to see how cruel the rule is. Scoring 77.5% is a necessary condition to have a shot at this, but how close is it to being a sufficient condition is key. 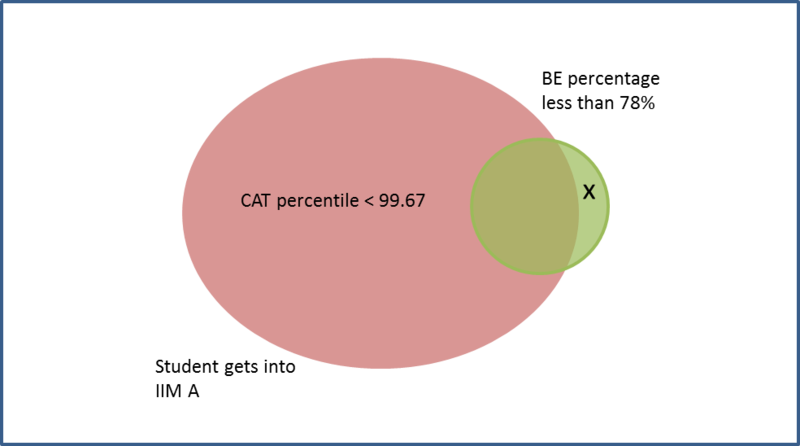 To give an extreme example – Prob (IIMA admit / student does not take CAT) is also zero. This does not mean that merely taking the CAT will ensure an admit. In this case, the condition taking CAT is necessary but not even close to being sufficient. What we need to think of is this wonderful Probability(BE score being the reason for missing out / student did not make it to IIMA). If a particular engineer did not make it to IIMA, what are the odds that it was the BE score that prevented him/her from doing so? Now, if that number is high, this is indeed an unfair criterion. Now, let us put a framework on to it. Now, if we have to attribute reason A as the key determinant for missing out then that should be the region where A alone is the reason. In other words, the region where an ‘x’ is marked. Any other region would include other factors also playing a part. scale. 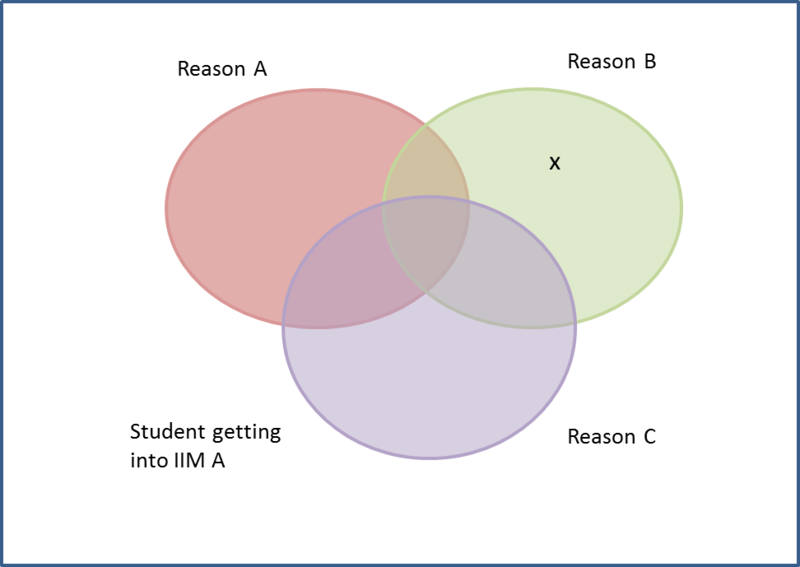 But I have drawn this diagram deliberately like this to convey that the big circle incorporates 99.67% of the candidates. The least percentile for an engineer to get a call from IIMA is 99.67. So, x can at the maximum be 0.33% of the candidates. So, in the worst case scenario 0.33% of the candidates appearing for CAT miss out because their engineering percentage is too low. Hold on, that’s not it. Let us add some more facts and assumptions (All you aspiring MBAs, also keep this as an important lesson. If you are peddling some hypothesis, you should always talk about facts and assumptions as if they can be used interchangeably. As long as you can incorporate your assumptions in along with the facts, you can peddle any theory). IIM Ahmedabad gives admits to probably ~180 engineers from general category, and they probably call around ~500 engineers from the general category for the interviews. Now, under the scenario that 1.65 lakh people take the exam, 0.33% of this is roughly 550. Among the top 550 candidates based on CAT score, CAT calls ~500 engineers. Assuming that around 20-30 students securing above 99.67 percentile are likely to be non-engineers, only around 20-30 engineers who score above 99.67 percentile miss out. So, probably only around 20 students miss out because of their UG mark. So, the number of students who miss out purely because of their BE percentages is possibly only around 10. Not 0.33% of test-takers, but around 0.01% of test-takers. Now, probably half the engineers (or more) will have a score of less than 78%. How come only 20 engineers miss out? This is because there is a very high correlation between academic records. So, the folks who score very high in CAT are likely to have scored high in 10th, 12th and UG and vice versa. So, what the 99.67 percentile cut off number tells us is that the students who have missed out due to other criteria are very unlikely to have scored 99.67 as well. A point that is completely lost on many students. The game is not rigged against you. The game is rigged against candidates who do not deserve to get in. In other words, it is a meritocracy. One of the best B-schools in India wants to make sure that they select only the best candidates available in India. Who woulda thunk? To speak without all this probability mumbo-jumbo – An overwhelming number of engineers who have scored less than 78% in BE and missed out on IIMA call would have missed out on the IIMA call even if they had a 98% in their engineering. To put it differently, the only Engineers who have a right to crib about IIMA’s high BE cut-off criterion are the ones who can and do score 99.67+. If you score 99.6 and do get a call from IIMA, it is not because of your percentages, it is because of your percentile. So, every time you feel like IIMA is conning you out of an interview call, tell yourself you have to get 99.67 to deserve the right to voice that crib. In case you are among the 20 unlucky souls who score above 99.67 and still do not have a call, my commiserations are with you. Chances are you have secured an admit into IIM B or IIM C and you have told yourself that you will never again miss out on anything because of some silly criterion. Probably a great lesson learnt, and one for which missing out on IIMA might be not such a big price. Next Post:What is Reading Comprehension Really About? I want to ask if I have scored average 70% in 10 & 12 .so I will not get admission in any iim college.